The French Leclerc MARS Armored Recovery Vehicle is the New Generation Recovery Vehicle. It’s hull has been lengthened with seven pairs of wheels. It’s equipped with a hydraulic blade at the front to clear battlefield obstacles. The vehicle is equipped with a hydraulic crane rated to lift 30000kg loads and a winch with 180m cable rated at 35000kg. A secondary winch is rated at 1500kg. The crane and winch systems are supplied by Rheinmetall Landsystemes GmbH. Used in single or double hauling. 3.40m wide controlled from the cockpit. 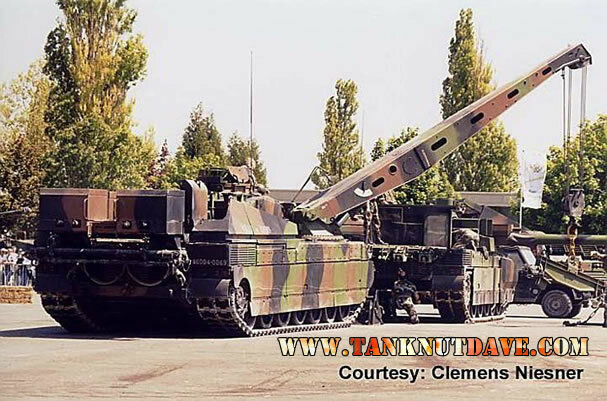 It fulfills the functions of land development, anchoring and trimming of the tank during craning operations. capable of lifting 30 tons, used the inside and outside the store. All tooling is contained in the module rear deck (MCA) filed by the crane. An auxiliary generator used to power the various tools in electronic or pneumatic energy. Fuel: 1400 liters of diesel.